This felt a little nerve wracking. The Internet in Vietnam gets glitchy at times. I was terrified my connection might crash in the middle of it all. We ran some tests and things were running smoothly. With an hour to go, I started feeling vaguely feverish. I gulped an espresso to get my energy level back up. At 2 a.m., I met online with Pam and Jonathan from Wildland, who were running the show in their Seattle office. A crowd of people was already logged into our virtual “waiting room.” Our plan was to flip the switch to go live so they could see us at 2:28, and begin our presentation at 2:30 a.m. sharp. We were all ready to roll. And then … at 2:25 … my connection dropped. Being a trained professional, I handled this situation calmly by muttering a long string of extremely sophisticated profanities. Somewhere in there, I must have said the magic word because at 2:29, my computer reconnected. I stopped swearing. Pam started her introduction right on schedule, and other than one five-second glitch, the webinar went smoothly. This was the first time I’d hosted a live webinar, and I must say, it felt strange sitting in my living room in the middle of the night, talking to my computer screen. I had an eerie feeling nobody was there, but we had a big crowd from places as far-flung as Peru and Chile, Laos and Mozambique. 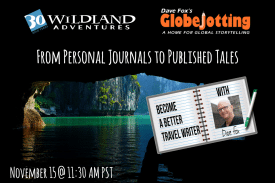 For the first 30 fast-paced minutes, I offered my top tips from my travel journaling and travel tale writing workshops. Then, for another half hour, I answered questions about interviewing, note-taking, and writing techniques. What a fabulous seminar. I highly recommend it for any writer planning a trip, or like me, returning from a trip to after-the-fact journaling. My Rick Steves tour to France was so action-packed, I had little time to write, aside from some quick notes. I won! I won! I was Runner Up #1 and look forward to taking your online classes. Thank you.